Today, I'm sharing the second half of our weekend getaway road trip to Dallas earlier this year. When we only have a weekend to sneak out of town, we tend to focus on one neighborhood in whatever city we're visiting. For this Dallas trip, we spent our weekend exploring Downtown Dallas and the adjacent Uptown neighborhood. We found a ton of fun things to do -- and great places to eat -- within a 15-minute drive from our home base at aloft Dallas Downtown hotel. Our spacious King Ultra Savvy Suite felt more like a high-rise loft apartment than a hotel room. Our suite featured high ceilings, a comfy King bed, a comfy living room, and a modern bathroom. Talk about a home away from home! After a restful night sleep, we headed out on Sunday for brunch at Saint Ann restaurant. 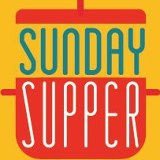 This upscale casual restaurant is located in the Harwood District near American Airlines Center and Klyde Warren Park. Saint Ann is located in an historic school building that was built in 1927, and it boasts the largest garden patio in the city. It's also an ideal brunch location! We were quickly shown to our table and presented with fabulous mimosas while we looked over the brunch menu. We decided to start out sharing a spicy starter, a refreshing salad, and a fabulous cheese and charcuterie platter. The Heirloom Tomato Salad included burrata, basil pesto, a balsamic reduction, and a sprinkle of Maldon sea salt. This salad was sheer perfection -- bursting with amazing flavors and textures. The spicy Bacon Wrapped Sizzlers were a fun spin on jalapeno poppers -- featuring chunks of marinated chicken, jalapeño, onion, a fabulous housemade ranch dressing. We were literally fighting for the last sizzler -- they were that addicting!! 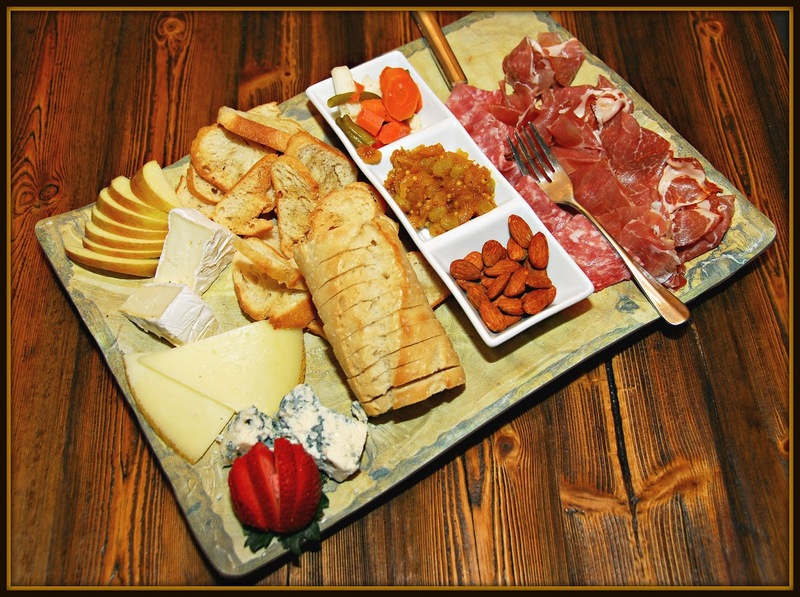 The beautiful cheese and charcuterie display featured a variety of cheeses, sliced pear, bread, nuts, chutney, pickled vegetables, and smoky meats. It was a great combination of sweet, savory, and salty/smoky. Our brunch was off to a fabulous start! Up next were a duo of brunch entrees. 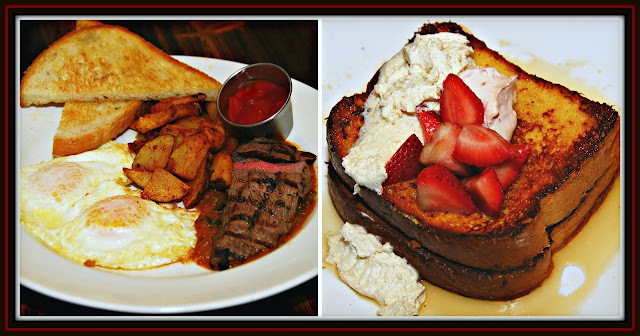 We shared savory Steak & Eggs and sweet "Strawberry Shortcake" French Toast. The bistro fillet was cooked perfectly medium rare and paired with over easy eggs, toast, and spicy ranchero potatoes. The French toast was decadent, featuring strawberry whipped cream cheese, maple syrup, strawberries, and vanilla whipped cream. Swoon!! 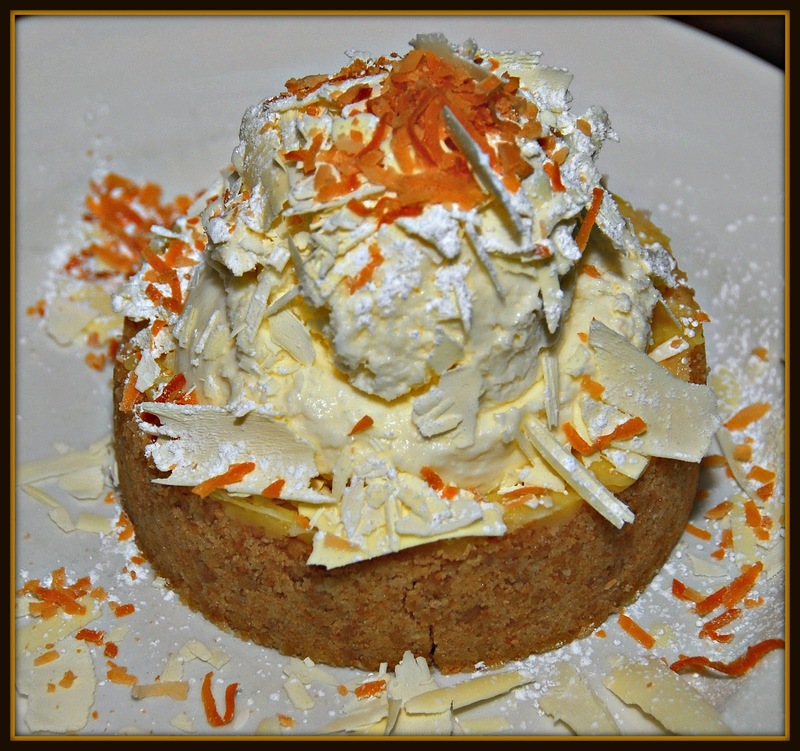 It was so good that it could have been dessert...but the chef surprised us with a duo of decadent desserts to sample. 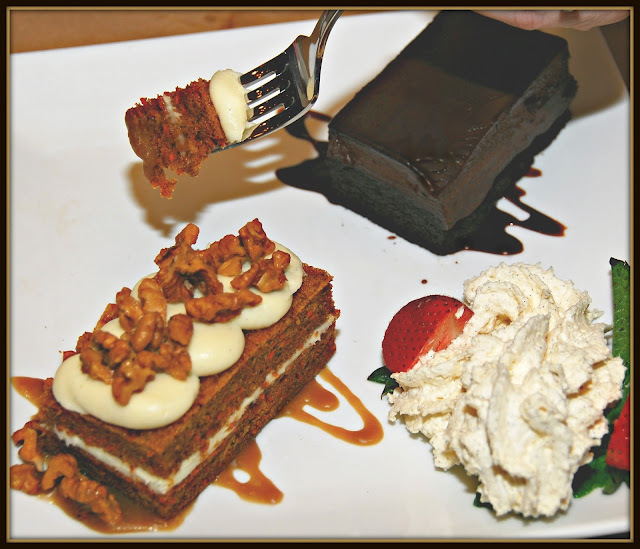 We thoroughly enjoyed the carrot cake with its tangy cream cheese icing...and the intensely rich chocolate torte. These two desserts were the perfect sweet ending to a fantastic brunch. From brunch, we headed out to explore Dallas from great new heights! If you've ever visited Dallas, you've likely seen the iconic Reunion Tower that's part of the city's Downtown skyline. When night falls, the sphere on top of the tower is lit up with more than 250 LED lights. What you might not know is that the GeO-Deck observation deck is located inside the globe on top. This observation deck is located 470 feet in the air and offers 360-degree views of the city! 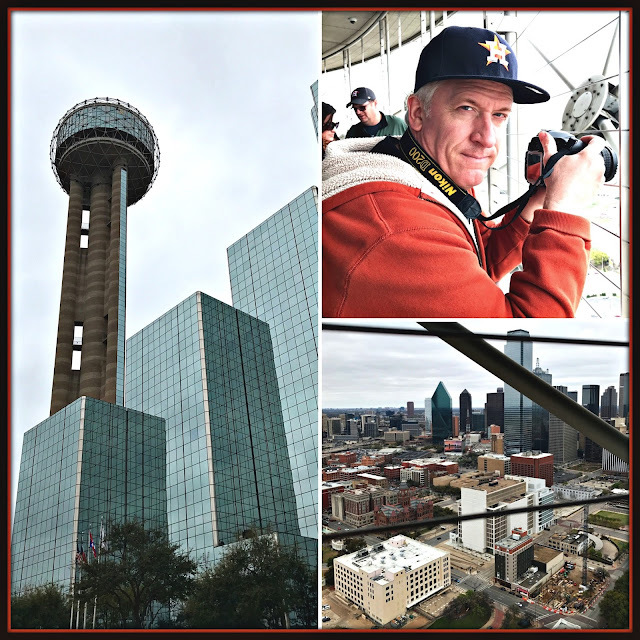 We had a great time taking in the birds-eye view for miles around -- and snapping a few pictures from this fabulous indoor/outdoor observation deck. I even took a few moments to shoot a video that shows what the experience was like. Before we knew it, our time in Dallas was nearly over...but we still had a couple of culinary adventures before hitting the road back to San Antonio! First up was a quick pit stop to feed our collective sweet tooth at Hypnotic Donuts, the hippest donut shop in the city. 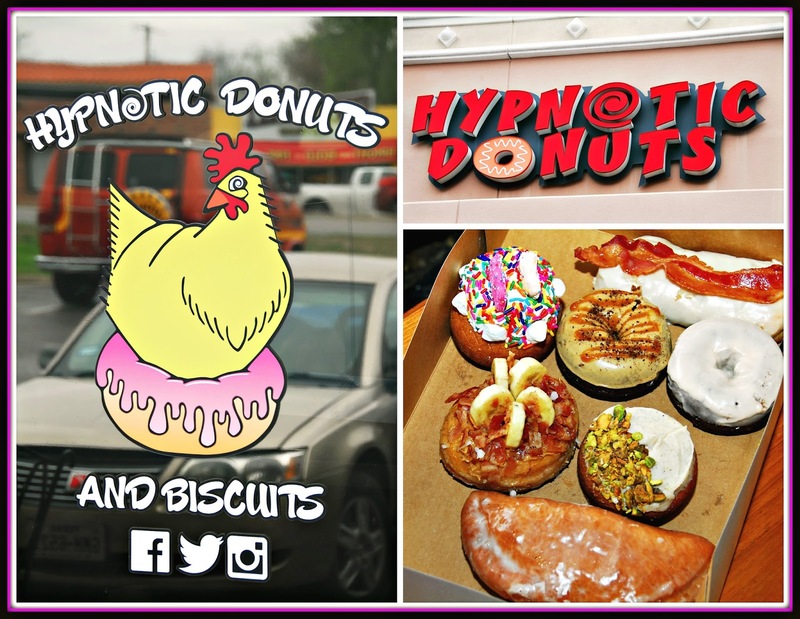 Hypnotic Donuts features creative donut flavors that have devotees lining up for their favorites. We sampled a wide range of both yeast and cake donuts. All of the were delicious, but we especially enjoyed the Zooropa (vanilla cake donut topped with frosting sprinkles, marshmallows, and circus animal crackers!) and their signature Evil Elvis (yeast donut with peanut butter, banana, bacon, and honey). It's a good thing there were four of us sharing -- we got to sample each flavor without experiencing sugar overload. Our final Dallas culinary stop was an early dinner at Uptown's Del Frisco's Grille. 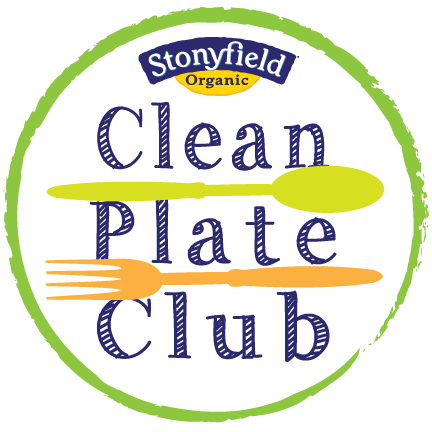 This is my kind of restaurant -- upscale decor, fabulous food, and a casual vibe! We started out with cocktails and a duo of shared appetizers. If you love milkshakes, their Adult Milkshake -- for grown-ups only. This decadent, creamy cocktail features Nocello walnut liqueur, chocolate liqueur, and vanilla ice cream. Rich...but amazing! We paired our cocktails with fresh-made Spicy Guacamole and their signature Cheesesteak Egg Rolls. It features the flavors of the iconic sandwich in a crispy egg roll wrapper, and it's served with honey mustard and a sweet-spicy chile sauce. What a perfect combination of flavors and textures! 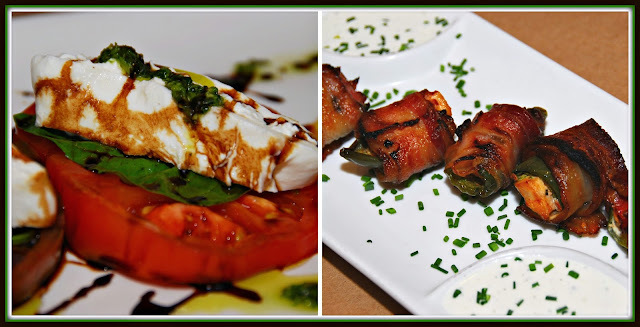 We shared two entrees: one decadent and one on the lighter side. The hearty Steakhouse Salad is comprised of perfectly grilled sliced prime steak, a deviled egg, baby mixed greens, creamy avocado, crumbled bacon, parmesan and blue cheeses, and a tangy lemon horseradish dressing. It's a salad that even non-salad eaters will enjoy. I loved the fun mixture of flavors and textures here -- and I didn't feel like I was missing out by having this entree salad. On the decadent end of the menu was the Filet Mignon and Lobster Tail (i.e., a classic surf 'n turf! 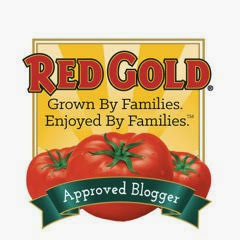 ), served with ultra-rich jalapeno-bacon mashed potatoes. This combination is a classic for a reason -- sweet lobster and perfectly cooked medium rare steak. We were pretty stuffed by this point, so we opted to share one dessert from the impressive Del Frisco's Grille dessert menu. Since we're coconut lovers, we easily agreed on their signature Coconut Cream Pie. A graham cracker crust is filled with a creamy coconut filling, a generous amount of whipped cream, white chocolate shavings, and toasted coconut. This pie is pure coconut goodness...and so rich...making it a perfect dessert to share. 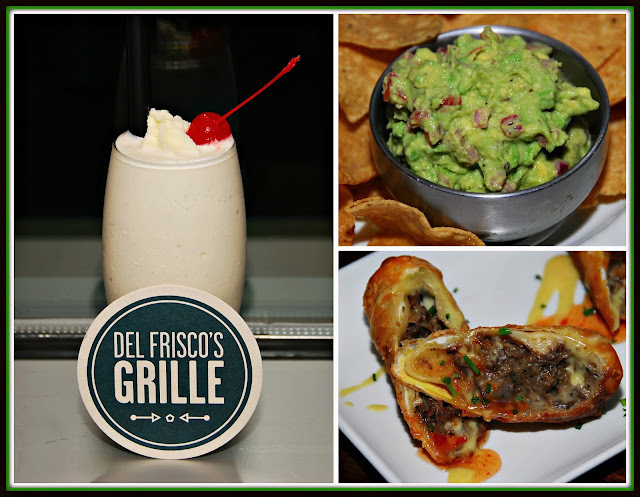 With that, our amazing dinner at Del Frisco's Grille...and our weekend in Dallas... was officially over. We jumped in our rental car and started our journey home to San Antonio. If you're looking for a weekend getaway that features fun and educational attractions and delicious food, Dallas' Downtown and Uptown neighborhoods are an ideal place for you to visit! Disclosure: aloft Dallas Downtown provided us with two nights of complimentary accommodations to facilitate inclusion in this article. Reunion Tower provided complimentary admission to their GeO-Deck, and all restaurants featured hosted our meal to facilitate coverage. All opinions expressed are solely my own.